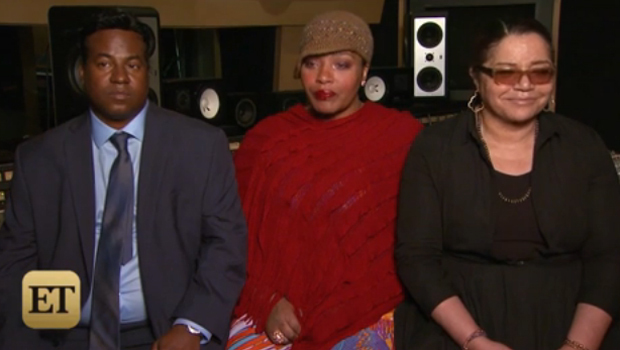 After "Blurred Lines" victory, Gaye family takes another listen to "Happy"
"My heart started pounding but I still had faith that the verdict was going to go our way," Janis Gaye, Marvin's ex-wife, said of the moments just before the verdict was read. And when the jury ruled in their favor, emotion swept over the room. "That's when I lost it completely. And I was filled with incredibly powerful emotion." While the family was just awarded $7.4 million -- and is currently seeking an injunction against the song -- that doesn't mean their legal battle is over. According to some online, Williams' 2014 mega-hit "Happy" bears a similar sound to Gaye's "Ain't That Peculiar." "I'm not going to lie. I do think they sound alike," Nona Gaye, Marvin's 40-year-old daughter, said. However, she added that she wasn't thinking about the legal implications right now. "We're not in that space." "I heard the mash-ups -- but I didn't really need to hear them," said Janis Gaye. "I know 'Ain't That Peculiar' and I've heard 'Happy.'" "Ain't that peculiar," quipped Marvin Gaye III. Still, the family said they weren't thinking about further legal action right now. "We're not in that space. We're just in the moment today and we're satisfied," Janis added. So how does the family respond to critics who say that, even though "Blurred Line" and "Got to Give It Up" have a similar feel, that doesn't mean the elements were stolen maliciously? Where is the line between theft and simply finding inspiration in music that came before your own? Add to it the fact that Williams reportedly wrote "Blurred Lines" in under an hour, the Gayes feel like Williams cheated his way to the finished product. "When I first heard that he had said he did it in an hour, my first thought was, 'That's because it was already done in 1977.'" Janis said. " So why would it take you any longer than 20 minutes... to redo something that had already been done 40 years earlier?" With this major legal battle behind them, the family has to refocus. "We didn't want to have to go through it [In the first place]," Marvin Gaye III said. "It's been a long journey so we need time to reflect... Right now it's all surreal." Watch this video for more from the family of Marvin Gaye.